Who are you? What are you? What is your identity? In today’s verse, we will dive into the topic of our identity as a Christian. In the book of 1 Peter, Peter encourages God’s elect, exiles scattered through the provinces of Pontus, Galatia, Cappadocia, Asia and Bithynia [1 Peter 1:1] to remain steadfast in the face of suffering and persecution, reminding them of their special privilege and identity as God’s chosen people, while instructing them of their proper conduct. 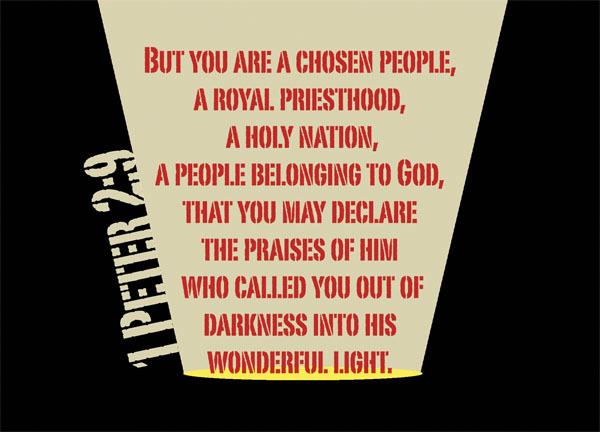 In 1 Peter 2:9, their special identity is elaborated as a chosen people, a royal priesthood, a holy nation, a people belonging to God, that you may declare the praises of him who called you out of darkness into his wonderful light. Taking Peter’s words literally have caused confusion for centuries amongst Christians, taking his words symbolically or metaphorically is also a move that cannot avoid confusion. In today’s study, we will attempt to decipher the huge message in this verse bit by bit, word by word, considering what Peter was most likely referring to when he pointed out each of these ‘identities’. you – as I’ve said, we’re doing this analysis word by word. Who is the ‘you’ that Peter was referring to? Let us refer back to his introductory greetings which all epistles always have – To God’s elect, strangers in the world, scattered throughout Pontus, Galatia, Cappadocia, Asia and Bithynia, who have been chosen according to the foreknowledge of God the Father, through the sanctifying work of the Spirit, for obedience to Jesus Christ and sprinkling by his blood [1 Peter 1:1-2]. I don’t know about you, but this – God’s elect, strangers in the world, scattered throughout Pontus, Galatia, Cappadocia, Asia and Bithynia – only serves to confuse me further as to who Peter was addressing. Some scholars explain it as the Jewish Christians who have scattered over those locations; others argue that Peter included Gentile Christians as the Christians pilgrims that have scattered all over – we can perhaps go into a more detailed study of all those arguments and their implications when we look at 1 Peter 1; but for this study, I’m going to take the stand that Peter was writing to the scattered Christian pilgrims – both Jewish and Gentiles; if only because it’s a wider and more liberated stand. a chosen people; a people belonging to God – The reason why I went to such lengths to explain who Peter was addressing in this letter is because this verse is talking about the topic of identity. We cannot not know who Peter was addressing if we want to talk about identity. Typically, the people that belongs to God is the Israelites [Deu 7:6]. By blood, by race, by tradition, they are God’s chosen people – though Paul says, Consequently, you are no longer foreigners and aliens, but fellow citizens with God’s people and members of God’s household, built on the foundation of the apostles and prophets, with Christ Jesus himself as the chief cornerstone [Eph 2:19-20]. Spiritually, those who are not Jews but follow Jesus are also regarded as God’s chosen people. This is a new identity that is given to all Christians – you are God’s chosen people. By putting your faith in Christ, you become God’s chosen people. You belong to God. You are God’s own possession. Therefore, as God’s chosen people, holy and dearly loved, clothe yourselves with compassion, kindness, humility, gentleness and patience [Col 3:12]. a royal priesthood – traditionally, priesthood in Israelite culture can only be attained by the descendants of Aaron. When Peter says we are a royal priesthood, it didn’t mean that anybody can just become a Jewish priest or anything like that. It just means that we no longer need a third person act as a mediator between us and God. We now have immediate and direct access to God. Also, we are no longer just common believers. We need to actively serve, actively live the life of a royal priest, serving God, serving his people, minister in the presence of God. It’s a priestly service. It’s a lifelong service. What does this identity as a royal priesthood makes us? It gives us a life purpose, if anything – and that is to minister as priests. a holy nation – As a chosen people, you belong to God, and you are no longer part of the world. Being separated from all nations, you have been set apart, sanctified in holiness; for holiness. Because God is holy, you are holy. And when you have been set apart in holiness, stay that way. Do not navigate your way back to the sinful waters. Stay holy. That is an identity. The Israelites have long been identified as a kingdom of priests and a holy nation [Exo 19:6]. However, throughout the history of Israel, we know that even though God has given us these identities, they don’t make us holy – it’s not that being given the identity of a holy nation, we suddenly become holy. It’s not that being called a royal priesthood, we suddenly live everyday in priestly service. No – it’s still a conscientious effort to realign ourselves to these identities everyday. God has many identities – most of them can be described by his names. Off the top of my head I give you some examples in Jehovah Jireh (Provider), Jehovah Nissi (Banner) and Jehovah Rapha (Healer). There’s also Isaiah 9:5 – and he will be called Wonderful Counselor, Mighty God, Everlasting Father, Prince of Peace. Likewise, we are given multiple identities as we follow Christ. It’s like our dual identity – as a person, but also as a Christian – this often compels us to make a choice, but unlike it, our multiple identities in Christ wouldn’t. I appreciate very much the care, attention to detail, and exegetical approach you use. Refreshing. Peter as with all the apostles except for Paul, was sent to the circumcision and it is clearly they to whom he is referring.